Objections, The Art and Science of Getting Past No and a lot more! Check out the full transcript starting Mon. 11/12/18, 6am PST on the Heinz Marketing Blog. 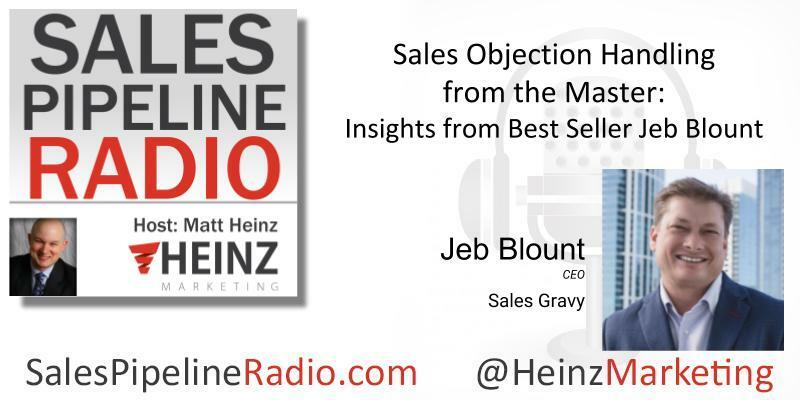 "The one thing that every one in sales faces is objections ...You get objections when you prospect. You get objections when you ask for next steps. You get objections when you ask people to buy and no one's immune. So it doesn't make a difference what you sell, it doesn't make a difference if you're short cycle/long cycle, if you're enterprise, if you're less complex. It doesn't make a difference if you're an SDR or you're an AE or you have a full desk. It doesn't matter. Every single person that sells is going to face objections. So it's important that you understand how to deal with them and get past them so you can be successful in your role." "I think it applies to people from all walks of life." Thank you to our sponsor, MailTag.io. MailTag.io is a Chrome browser extension for your Gmail that allows you to track and schedule your emails. It’s a super helpful recommend if you’re in sales because you can receive real-time alerts, right on your desktop, as soon as your prospects open your emails or click links within your emails. For more info, be sure to check out MailTag.io!